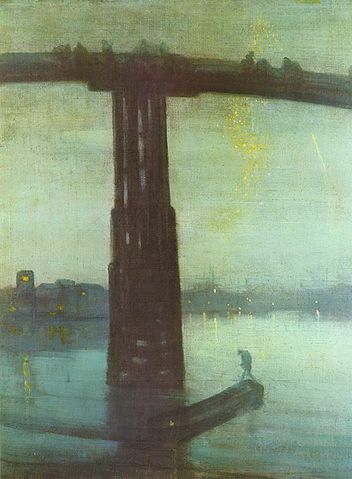 I have just been to see the exhibition An American in London: Whistler and the Thames, and thought I would tell you about it. Be prepared for very small, black and white prints, but also at least two stunning paintings, both of the Thames. 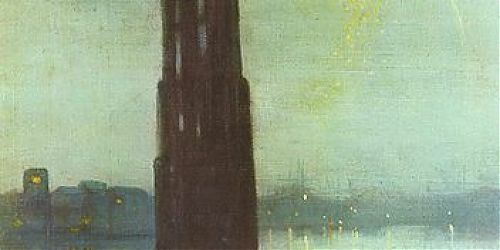 One is on the balcony of the Angel in Rotherhithe, with a fantastic crowding of ships and boats, masts and rigging, behind the main characters, two sailors and a woman – she was originally no better than she should be, but Whistler painted in more respectable clothes so that he could get the painting exhibited. The other picture is of old Battersea Bridge in the moonlight, a beautiful study in colour and light. Unfortunately the critics hated it, Ruskin described it as “a pot of paint flung in the public’s face”. The prints are very detailed and show the working river in the late 19th century. BUT, all the etchings and drypoints are reversed images, so if you were hoping to find information about the riverside, it will be quite difficult as everything is back to front! Whistler worked on the spot, he took a metal etching plate and drew on it in the open air, which makes the images very immediate, only then when he went back to the studio to print them, the images of course came in reverse. He worked a lot in Wapping, and lived for many years in Chelsea, and obviously loved the river. Yes, you say, but what about the plumbago? One of the prints shows a view across the river to a plumbago factory in Battersea, personally I had no idea what plumbago was, but that’s what Google is for. It’s some sort of graphite. After looking at pictures of plumbago flowers, (pretty but not relevant), I found the Grace’s Guide website, and a page about the Patent Plumbago Crucible Co. In 1856 the Patent Plumbago Syndicate (you couldn’t make the name up!) obtained the rights to manufacture graphite crucibles from an American company, and built a factory in Battersea to do this. There are examples of their advertisements, and testimonials from satisfied customers, even a line drawing of their crucible. In 1881 they became the Morgan Crucible Company, and they are still around, although the Battersea factory closed in the 1970s. I don’t know if any FROGs are looking at the Battersea area, but this is some riverside industrial history to look for. I’m sure Whistler didn’t care what the factory made, and when looking at his picture, neither did I.
I thought it was a wonderful exhibition; I hope you’ll go and see it.